Creating a healthy home, healthy bodies, and healthy babies! If it’s too good to be true, it probably is. I’m sure most people have heard this time and again. Therefore, when I heard about dryer balls and how they supposedly cut down on drying time and are as effective as dryer sheets for making clothes soft, I was of course skeptical. I didn’t think there could be a reusable product that didn’t contain chemicals that were this great because honestly, dryer balls look too good to be true. Really? THESE help drying time? 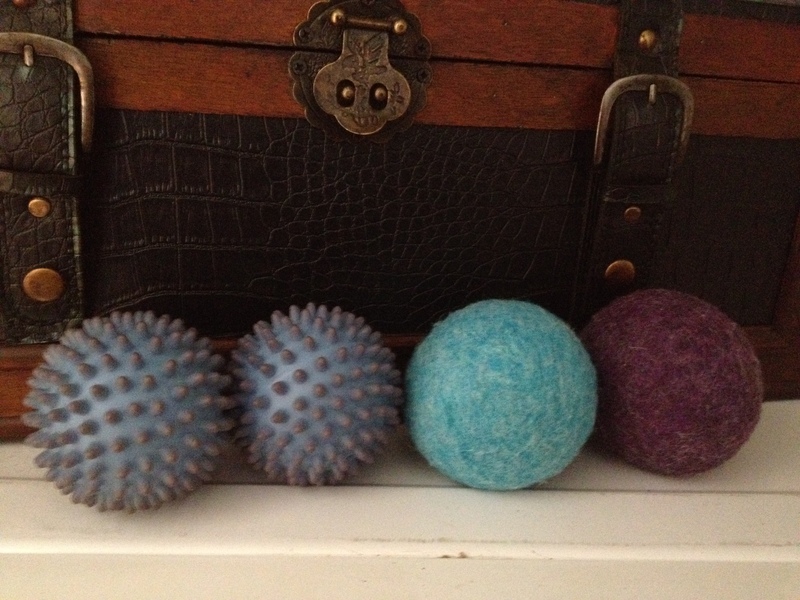 My husband and I were even more skeptical when we actually saw the WOOLY ROUNDS (above) dryer balls that were sent for review. See, the theory goes that the balls bounce around in your dryer and work to separate the clothes (to prevent the clothes from becoming a big ball in the dryer) to allow for better air circulation, thus reducing drying time. I wondered how this could *possibly* be true because it seems that the balls aren’t heavy enough to actually do anything to separate wet clothes, and they would just end up contributing to the big ball of clothes. So, me being a scientist, I put these to the test and designed an experiment so I could see for myself. We'll see, WOOLY ROUNDS. We'll see. 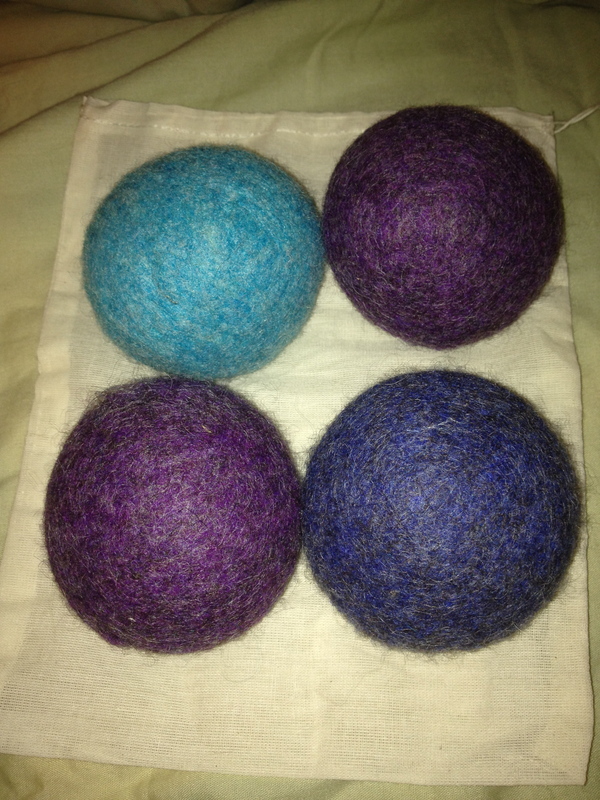 I was sent a set of 4 WOOLY ROUNDS in a drawstring storage bag (above) for the review. I took a normal load of clothes that we would run any day and put it in the washer and in the dryer without the dryer balls. One dry dryer ball weighed about 75 grams according to my food scale. I hypothesized that they would make no appreciable difference in drying time of a standard load of clothes. 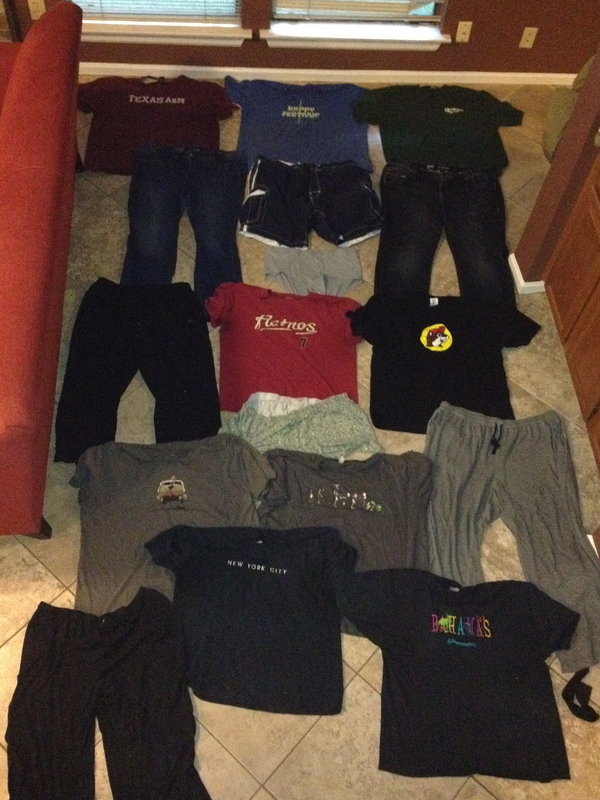 The clothes were washed and rinsed like normal, and put in the dryer. We set the clothes to dry on a 60 minute cycle and checked for dryness in 10 minute intervals, and after 60 minutes the clothes were still not completely dry. Patches of shirts, pockets of jeans and pajama pants, and random patches of pajama pants were still mildly damp. The same load of clothes were worn again (in similar situations and doing similar activities) as the control (no dryer ball) trial and washed again with the same wash temperature settings, same detergent, same washer and dryer, and same dryer temperature settings. The clothes were again set on a 60 minute dry cycle and checked for dryness in 10 minute intervals throughout the cycle. 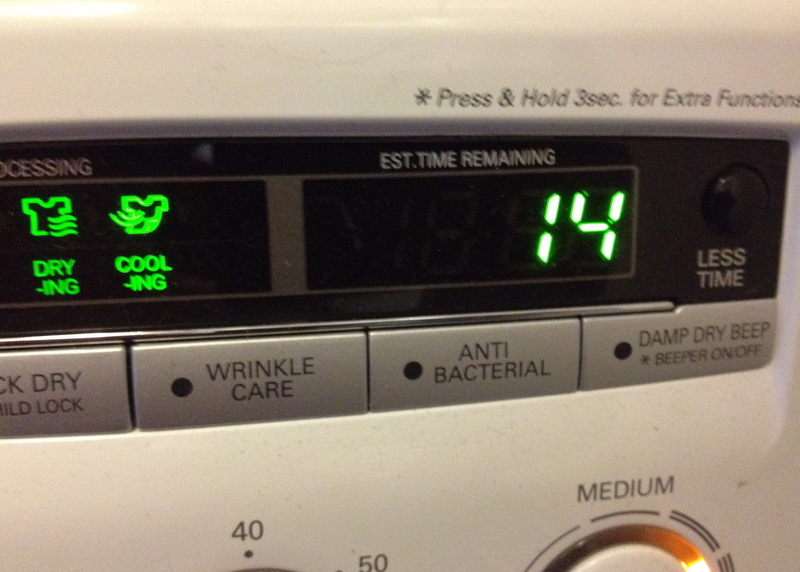 The clothes were completely dry with no dampness detected with 14 minutes to go in the cycle. I repeat: the dryer balls helped drying time by about 14 minutes. We repeated the process with various loads of clothes throughout a 2 week time period, and got basically the same results (14 minutes ended up being the average time savings across all of our loads of clothes). Now, for one load, that doesn’t seem like much at all. But if you think about how many loads of clothes are washed and dried in a week (or even a month), that adds up. Drying Time Rocks, What About Softness? My husband and I used dryer sheets all the time with our old dryer, but since we read that build-up can occur due to the melting of the softener on the sheets we decided not to use them in our new dryer. Since we haven’t been using dryer sheets at all for the last several months, I can’t compare the softness of the clothes after using the dryer balls to the softness of the clothes after using a dryer sheet. However, I can definitely say that the wool does a great job of softening the clothes compared to not using anything at all. During one of the loads of clothes over the course of the 2 week review, I pull the balls out of the dryer after about 30 minutes to test dampness. Everything that I had read about wool says that they can absorb water readily. 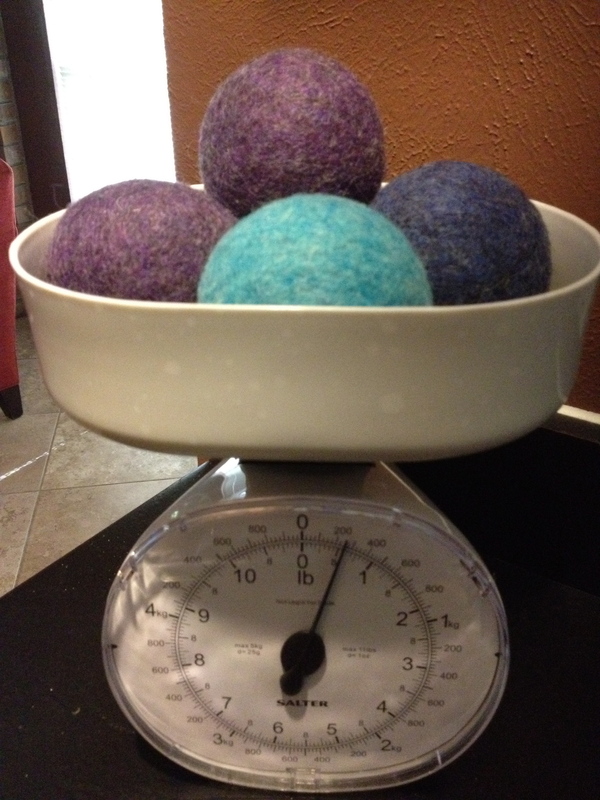 A dry WOOLY ROUNDS ball weighed 75 grams, but a damp WOOLY ROUND weighed about 110 grams. My theory is that the balls absorb water from the clothes, but because of the nature of the balls they dry faster than the cotton clothes and that’s why the drying time is reduced. Therefore, the more WOOLY ROUNDS you have, the quicker the drying time because the more water is getting absorbed by the dryer balls. For fun, we tested them against some plastic type of dryer balls. The plastic balls (below) made absolutely no difference in drying time, lending credence to the water absorption theory. Additionally, it’s possible that as the WOOLY ROUNDS gain water weight, they are working better to pull the clothes apart because I think the heavier they are, the more effective they are at preventing a laundry ball. I have a dryer that has a clear door (unfortunately reflection prevented decent pictures), and I could see the clothes spread out more. I tried to take video to compare the two drying cycles, but again, reflection prevented this. Would I Buy WOOLY ROUNDS? In short, I would absolutely purchase and recommend these. WOOLY ROUNDS are made right here in the USA from wool made at Bartlett Yarns, also in the USA. They are natural and don’t leave a weird film on clothes like dryer sheets do. They are safe for cloth diapers as well! 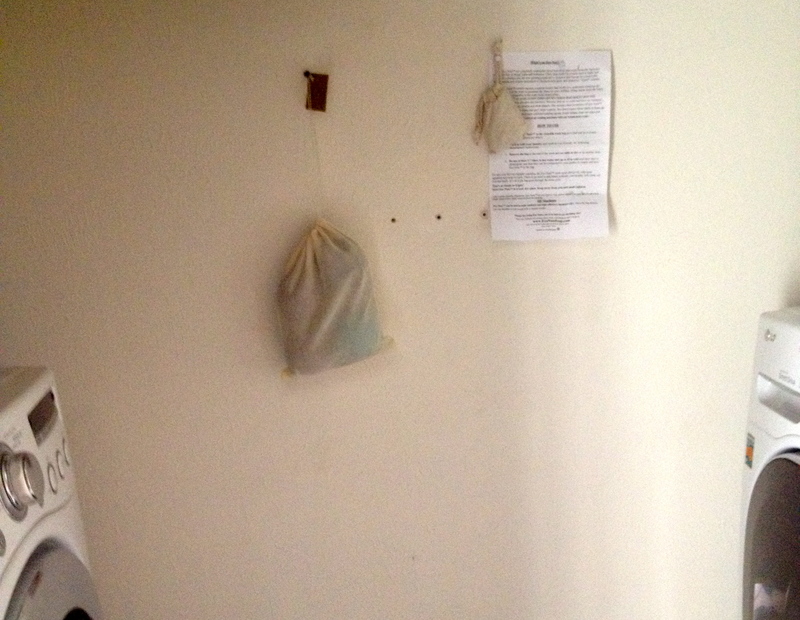 We hung the bag on the wall of the laundry room so that we can pull each ball out as we unload the dryer. I’m afraid that if I were to accidentally drop one on our way to the bedroom with the clothes that our puppy would find it and think it’s a toy. One of my favorite aspects is that they come in all kinds of fun colors. If you know anything about me, you know that bright, colorful things are important to me. The colors don’t bleed either! I have found no evidence of color bleeding on any of our clothes. Do You Want Some WOOLY ROUNDS? You can invest in a set of WOOLY ROUNDS on their website for $8.00 per ball, or in packs. A pack of 3 WOOLY ROUNDS costs $22.50. 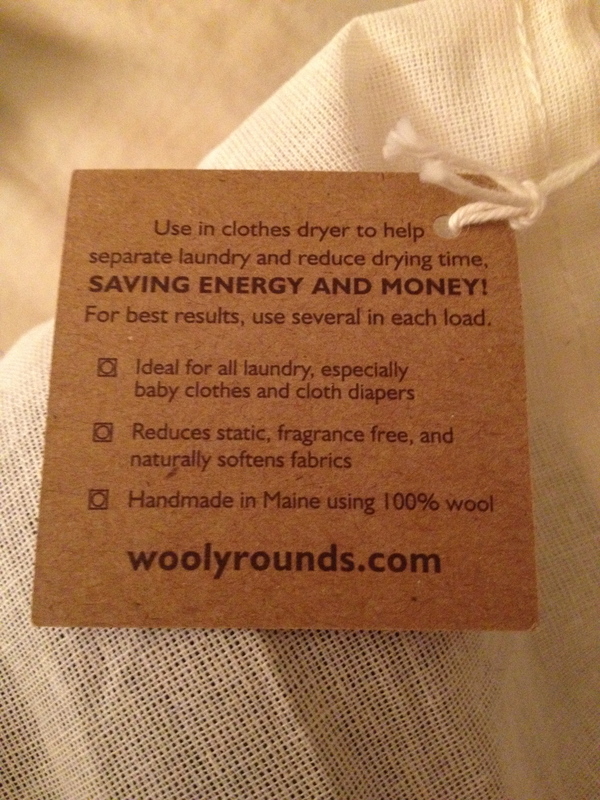 The funds invested in WOOLY ROUNDS would be made up quickly in energy savings. WOOLY ROUNDS has generously offered to give away a set of 3 dryer balls so that more people can benefit from the drying time savings! To enter just fill out the Google form below. The giveaway ends 4/14 at 11:59PM CDT. The entries with the red stars are mandatory. This giveaway is open to U.S. and Canada only. Enter your email address to follow Let's Call It Crispy and receive notifications of new posts by email.